Some days we spend reading, writing, multiplying, dividing, converting, measuring, drawing, listening, experimenting, building. On other days we simply embrace the gift of time spent with friends and family. I love flexibility. This week started with a huge party at a camp down in the foothills. We didn't have co-op classes Monday because of Presidents' Day, so that made a perfect get-together day. One of Duncan's friend's was celebrating his birthday, and he invited everyone in our support group to come help him celebrate! Fortunately for his parents, "only" about 50-60 people showed up. They had a marvelous time climbing up and down hillsides and playing in the creek for a few hours, while we moms had a chance just to chat. That's called bliss, all around. Tuesday, Wednesday, and Thursday were regular kind of days. This was Scouting Thursday, and we've been working on the sign language badge in our American Heritage Girls troop. The college in our city has a deaf studies and ASL major, so we've been blessed to have students from the program come and teach the girls sign language. This week a young deaf woman came to speak to the girls through an interpreter about her life as a deaf person. She was fabulous, and we all learned so much. Today I fully intended to do all kinds of book work, but my parents needed us to come over and help them. The high winds last night had blown their greenhouse clear across the yard, so Duncan and I helped Dad get it back in its spot and tie it down. Afterwards we played a game of Upwords with Mom and Dad. Duncan was looking a word up in the dictionary, which triggered a memory for Dad about the Great Depression. Dad was telling us that when he was a boy, his one-room school received an amazing gift from the state: a dictionary. He read through the entire dictionary, and then a couple of years later, his school received a whole set of Compton's Encyclopedia. He couldn't believe how fortunate they were to get such a treasure! Of course he read through all of those, too. And in sixth grade, the state bestowed upon his little school the gift of 50 fiction books. My mom then jumped in to tell Duncan about how she and three other kids were picked to go directly into 2nd grade (there wasn't any kindergarten back then), skipping first grade, because the first grade was too crowded. So the summer before school started, her mother gave mom and her three friends a crash course in first grade so that they wouldn't be behind as they began 2nd grade. Mom ended up skipping ahead a grade or two anyway later on. Mom also told us about how so many families were suffering from the Depression and didn't have food, so her mother started making giant pots of soup for all the kids to eat. They figured years later that this must have been one of the first school lunch programs. Now that's a history lesson, and a morning well spent. * The Carnival of Homeschooling. This week it is hosted by Melanie at Raising Real Men. 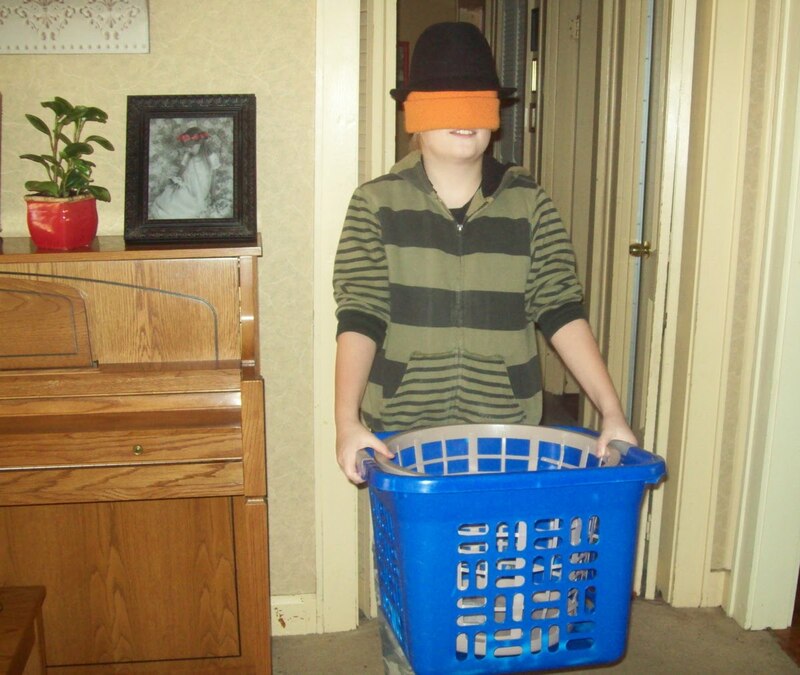 * The Weekly Wrap-Up at Weird, Unsocialized Homeschoolers. 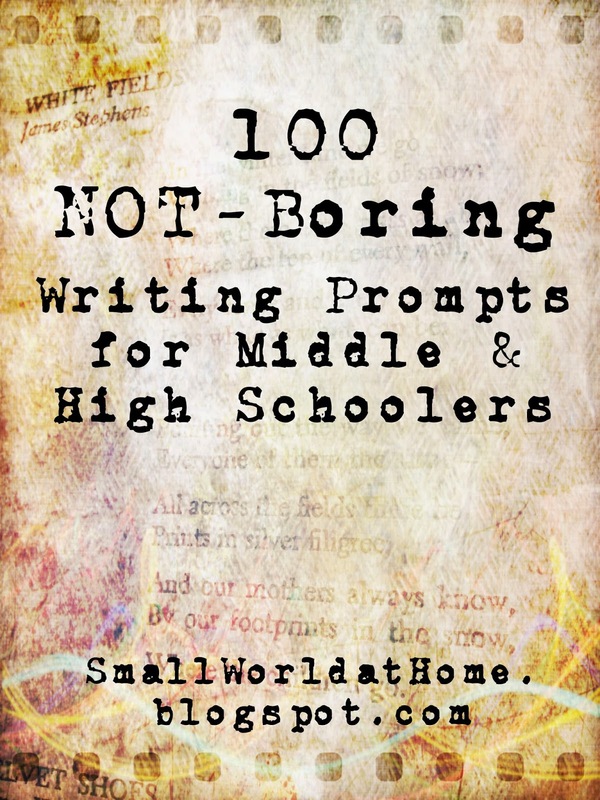 I like reading what other homeschoolers do on a weekly basis. * Simple Homeschool. And not just because I'm a contributor. The articles there are smart, savvy, and relevant. * The Homeschool Classroom. Ditto, and lots of hands-on, put-in-practice type ideas. * The Pioneer Woman Cooks. I know, I should be reading her homeschooling posts. But really it's her recipes that are a tremendous help to my life. 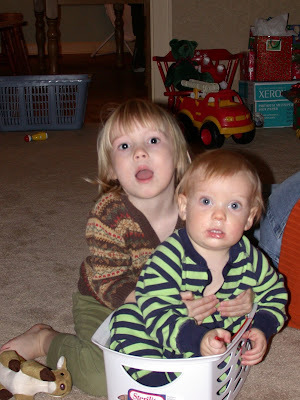 * Paula's Archives of Homeschooling Advice. Just everything is here. 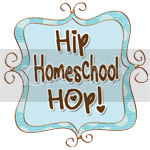 * Donna Young's Homeschool Printables and Resources. Everything else is here. 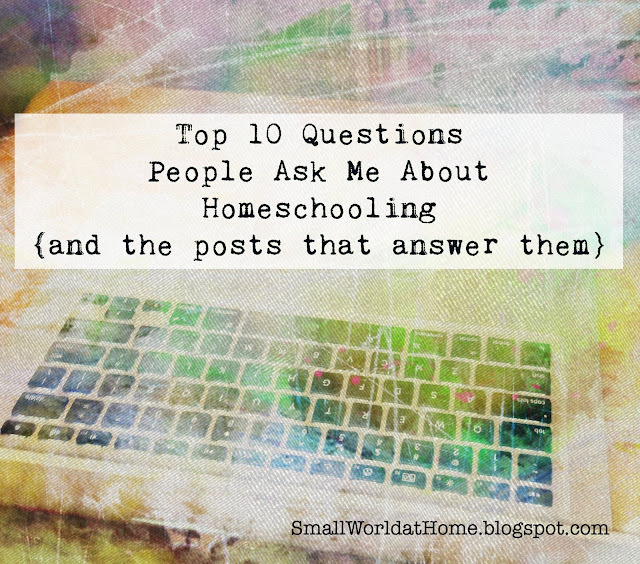 What are your "must read" homeschooling blogs? As the resident grammar fanatic, I enjoy participating in any discussion about language arts. Contrary to expectations, my advice is always to take it easy during the “little” years, particularly in regards to grammar. I hate to see seven-year-olds churn out page after page of tedious sentence labeling. * We watched the BBC production of The Silver Chair, having finished the book a week or so ago. We generally agreed that while the latest Narnia movie, The Voyage of the Dawn Treader, had great special effects, we prefer the no frills version that sticks with the book. We liked the BBC version. It was cheesy in parts, but we're okay with that. * I blogged about "Watching Geography." This week we watched an IMAX movie about sea life and another about storm chasers. The latter one made me fall asleep. Next week we're starting on National Geographic movies. * Laurel has decided to add SAT practice to her grammar studies. She loves doing the verbal components to the SAT, and I'm sure not going to discourage her. I have a bunch of guides that I found in the free bin at McKays Used Books, so she's having fun with those. * Duncan's duct tape wallet business is booming. He can't even keep up with all his orders. He's doing a great job saving all his money, but he's itching to buy something. * I wrote a post on Simple Homeschool called Burying the Big Yellow Bus. If you don't subscribe to Simple Homeschool and you're a homeschooler, you really should. Browse back through January for the Day in the Life series. Great stuff! * And finally, I turned 45. Birthdays are, of course, holidays around here. And tomorrow is President's Day, another holiday, which makes me so happy. We have a break from co-op classes, which means I didn't have to spend Sunday doing lesson plans. I haven't participated in Show-Us-Your-Life at Kelly's Korner for a long time, but this one I couldn't resist: our alma mater. I loved college. It all seems like a dream now, but those were some of the happiest and most heartbreaking days of my life. 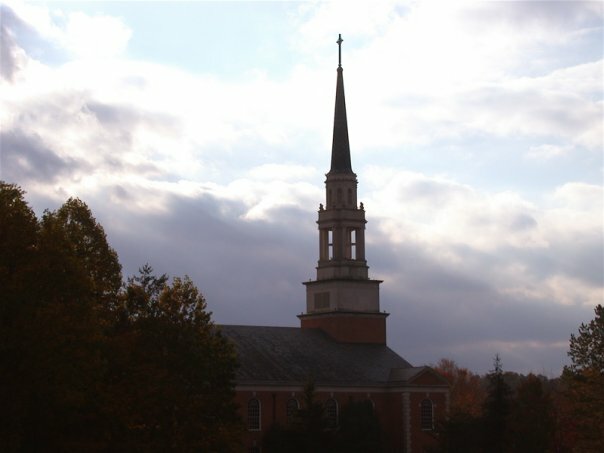 I attended Milligan College in Upper East Tennessee (now called Northeast Tennessee). People often ask how I got from upstate New York to East Tennessee. Three of my four brothers had attended Milligan, a small, private Christian college. In my memory, my parents basically gave me a choice of either going to Milligan or to Cornell University, where my Dad was a professor. I wanted to get out of New York, so I chose Milligan. And except for a brief period during my freshman year when I missed by boyfriend back home, I never regretted it. I spent four solid years of my life at Milligan—my coming-of-age novel, were I to write one, would take place here. I came into myself during those years. I embraced an exhilarating freedom, not just from living at home but from the confines of living in a small town all my life where everyone knew me. I could break out, break free of labels and boxes. I met a group of friends there that forever changed my life. Most of them are still beloved friends, and, well, one is my husband. We know each other's stories by heart. In college, past, present and future blend together in a way that is unique and perhaps not reproducible. Our collective memories are terribly strong from that four or five year time period. I am amazed at how easily we fall back into friendships, as if these past decades years were just a summer break. With an enrollment of just around 1,000, my college was small. Everyone knew everyone else, which could be bad at times. 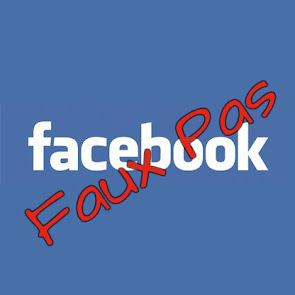 But we have always been a community, and I am amazed at the alumni reconnections made on Facebook. We all remember each other, for the most part. We may not have been more than passing acquaintances back then, but we find that the college ties bring us together now and that we really should have been friends then. I should probably say something about academics. I loved classes. I don't remember ever dreading going to classes, other than my education block classes and Earth and Space science. All freshmen and sophomores were required to take a Humanities program, which encompassed literature, writing, history, art, religion, philosophy and music. I probably was among a small percentage that loved this course, but everyone must have fond memories of all-nighters spent studying for Humanities exams. I was an English major with a history minor, so most of my classes were in those two field during my last two years. I also certified to teach secondary school, so I had to take some mind-numbing education courses and do student teaching at a nearby high school. That semester was my hardest one emotionally during my four years in college, so I have a bit of a sour taste in my mouth for coursework then. I know that I am glorifying my college days. It wasn't all golden lights and warm nights. I experienced heart-breaking loss more than once. I had to navigate the minefields of relationships and face hard truths about myself and the world. I struggled. 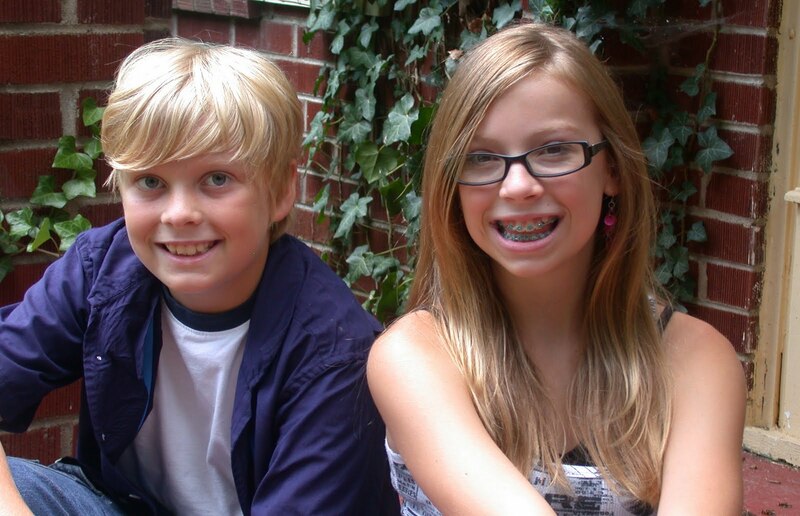 But for the most part, life was good and sweet and easy back then. We all lived on practically nothing, listened to a lot of music, and shared our clothes and whatever snacks we might have. How I wish for my children to have lives filled to the brim with the kind of amazing friendships I made in college. I know not all friendships come from the college years. I have a few good friends from high school, a few from our stint in Iowa, and a whole village of amazing friends here. It doesn't take much to bring it all back so clearly: the hundreds of meals shared, the constant buzz of conversation, the anticipation of the day and night ahead, the adventure, the joy and the despair, the smell of lilacs, the perfect sunset, and the dark hump of Buffalo Mountain protecting our little campus, sheltering us in its cool black shadow. My daughter wants to go to Milligan. If she can find half of what I found there, she will be one lucky girl. Yesterday was my 45th birthday, and I have to say it was pretty much the most perfect birthday ever. It was one of those days when everything fell into place, even though we didn't have any plans. The day before, I realized that my driver's license would expire on my birthday. I was not looking forward to spending my day at the DMV, but I was actually in and out in 10 minutes with a new driver's license. Best of all, I do not look like a convict in my photo. My mother did not have such luck. She went with me, determined to get her license renewed. At 83, she actually hasn't driven in a couple of years, but she wants a license anyway. Unfortunately, she didn't have the right paperwork. Fortunately, we had plenty of time to go eat lunch together at Panera, which is a rare treat for us. When I got home, the house smelled amazing. My daughter had made a chocolate cake AND cleaned up the kitchen while I was gone. I found a present on my front porch from a sweet friend and dozens more Facebook greetings. After my parents awoke from their afternoon nap, the kids and I picked them up and headed to the mountains. 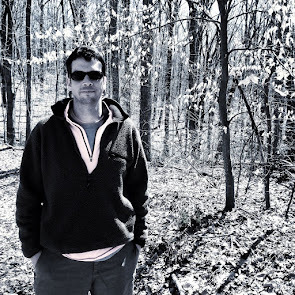 It was over 70 degrees here, and we had a short but beautiful hike on the Foothills Parkway. It was a little bittersweet for me, though. My Dad—my strong, strong, father—could not make it up the trail. He went about a quarter of a mile with us and turned back. I had to take a deep breath and keep going, treasuring even a quarter of a mile in the forest with my father. We came home to Randy grilling steaks and making all kinds of delicious side dishes. After dinner, cake, and the most perfect gifts from my family, we played a couple of rounds of cards with my parents. I am overwhelmed by this life at times: by the simple pleasures of family, friends, beauty, good food. My heart overflows with gratefulness to my God who is the giver of all good gifts. I am blessed beyond measure. It's happening! 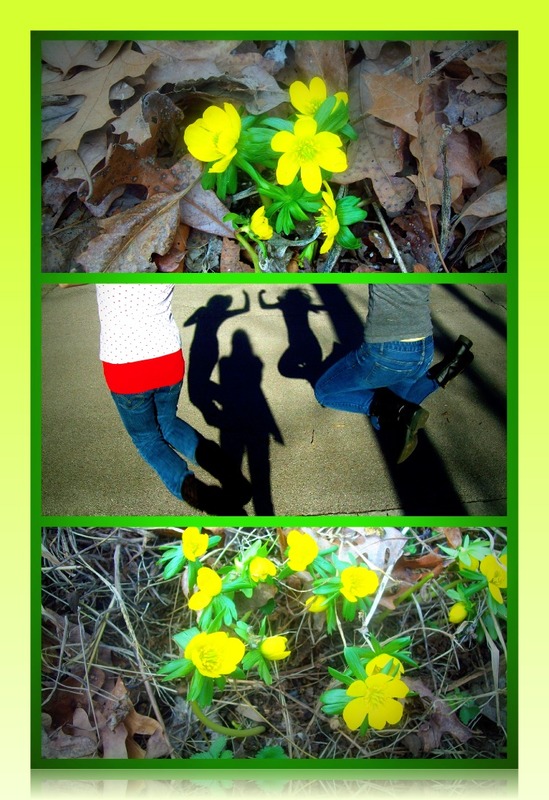 I was so surprised to walk outside yesterday and see our winter aconites in their full glory. The daffodils look close to popping, too. With the temperatures in the 60s for the next several days, I'm sure they'll be opening up soon. I love living in the south. This is my birthday week, and when I was growing up in upstate New York, we always had this week off from school for our "mid-winter break." We still had weeks and weeks of snow and cold to get through. Now I get the first signs of spring for my mid-winter birthday: tiny flowers and the kids jumping for joy in the sun. This year our geography studies are mostly visual. We've used various geography programs though the years, including the Trail Guides by Geography Matters. What I'd really like for my kids to do, though, is to make the connections between countries on the map (I really want them to memorize all the countries) and the various aspects of countries and their people that raise a spot on a flat map to an actual place in the world. I wish we could travel. Having lived in Germany and traveled in Europe, I know that there is no better way to learn about our world than to touch it. But we don't have the finances to travel at this point in our lives. I hope we will before our younger kids head off to college. So for now, we are watching our way through the world. Netflix is an amazing resource. I've added dozens of programs, including lots of IMAX, National Geographic, and PBS shows. I'd like to watch at least one or two programs each week, although we seem to average more like an hour each week. The kids really enjoy most of the programs, especially the IMAX ones. The biggest problem with "watching geography" is that I want to travel. Desperately. My parents were avid travelers. 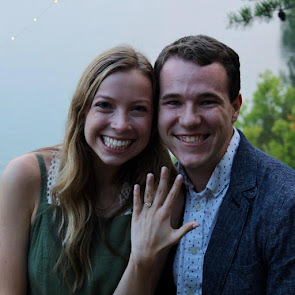 They have been on repeated visits to several countries in South America, much of Europe, Israel, Australia, New Zealand, South Africa, Japan, and of course most of the U.S. and lots of Canada. 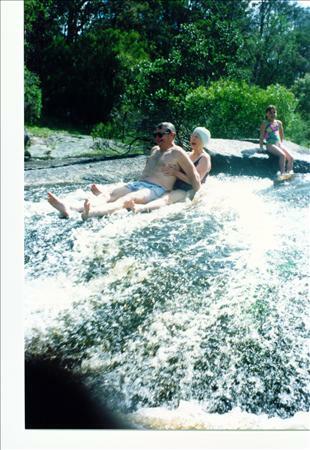 The photo above is of my parents nearly 20 years ago, when they spent 6 months in Australia. They would have been in their mid-60s then. 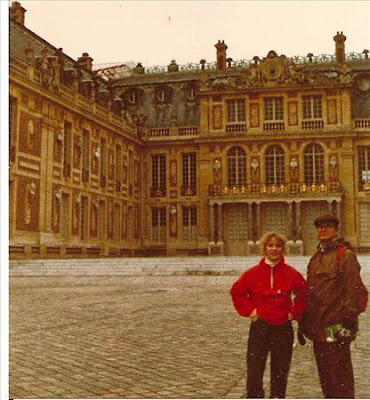 I was blessed to get to go with my parents to Germany when I was a junior in high school. 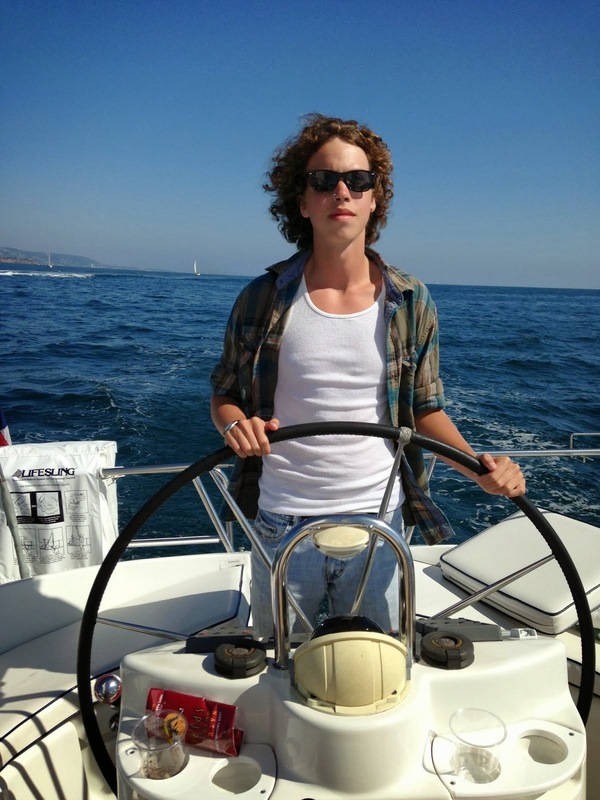 We traveled extensively throughout Europe during those seven months. What an education! That's my Dad and me at the Palace of Fontainebleau in France. I think of that time as the year I homeschooled myself, and that experience has proven to be invaluable to me in my life on so many different levels. Someday, I hope, we can take a few trips with our kids beyond the borders of the U.S. And for that matter, throughout the U.S. Until then, I am grateful for Netflix and the global glimpses it offers. How do you handle geography? Do you have any fabulous movie/program suggestions? I have never, in a fit of the frustration that is unique to homeschooling moms, threatened to flag down the proverbial Big Yellow Bus. But here is the flat-out honest truth: I have wondered every now and then if I should. That seems like so very long ago. Those little bare feet. We've come a long way since that Christmas 9 years ago. Their feet, by the way, are bigger than mine. We are in a good routine this year. While the scope of my personal responsibilities and commitments rarely changes from year to year, somehow just having the kids older alleviates so much of the physical exhaustion of being a parent. I never have to be a referee between siblings anymore. We don't have any crying children, except for the occasional injury. There aren't toys scattered all over the living room. I know I should feel wistful—and occasionally I am—but I have to say, I love this season of life. On the homeschooling front, this also means that everyone can read fluently, add, subtract, multiply, divide, name the continents, play a game without crying or quitting, and find the subject and verb. At 13, my daughter could easily live on her own. She can manage her money, cook anything, do laundry, clean house, take care of kids, and, most importantly, make a pot of coffee. But I'm not in any hurry to have her fly the nest. The past couple of weeks we've continued on with our regular studies with some excitement mixed in with the routine. For one, Duncan mastered his multiplication tables! He has been working on them so diligently for several months. He was very, very proud of his accomplishment. Plus, I rewarded him with 10 bucks. We had some pretty weather recently. Here's Duncan outside reading Old Yeller. And no, it wasn't really warm enough to be barefoot. In our Narnia studies, we finished reading The Silver Chair. This has always been one of my favorites, but Laurel wasn't crazy about it. We have the BBC movie coming via Netflix for next week. We only have two Narnia books left to go, and then we'll read George MacDonald's The Princess and Curdie and The Princess and the Goblin. We watched the first 4 DVDs of The Long Way Down, which is a documentary by Ewan McGregor and Charley Boorman, as they travel from Scotland to Cape Town, South Africa, journeying through Europe and Africa. This is not at all what I thought it would be. There is a lot of swearing throughout (one must ask: why? why not edit this out? ), which was annoying, but we pretty much watched four hours of McGregor and Boorman on motorcycles. I was expecting plenty of good cultural stops, historical information, etc. I'd love suggestions of great geography movies. Laurel attended the Black and White dance, an annual teen event in our support group. We have such a fantastic group of teens. I am really overwhelmed by how blessed we are to be part of this group! And so our weeks continue on. Jesse's glad to be back at college and looking for a job there in Nashville. He misses working and feels like he can easily work and study. His roommate watches TV all the time, which makes him crazy, but otherwise all is well. And that's what's happening in SmallWorld! 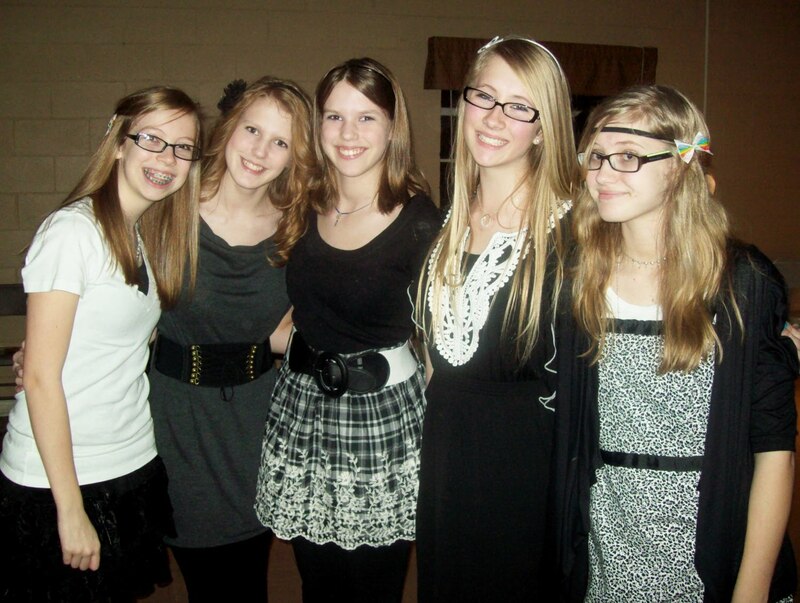 Our homeschooling group had a teen dance last weekend (yes, the theme was black and white). Looking through the pictures later, my overriding thought was: why were we so awkward in 8th grade, and why aren't they? Was it really all perspective? Did we just think we were awkward, but actually we looked as fantastic as my daughter and her friends? Sadly, I think the answer is no. 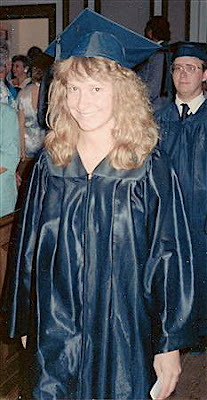 I truly believe that those of us who grew up in the 80s actually were awkward. We had ugly glasses, bad hair, and in upstate NY anyway, we wore Earth shoes with the GASS stamp on the bottom. The end. * Happy New Month! The days are flying by for no particular reason. I could use a catch-up day, a teacher in-service day. What a great thing it would be if a bunch of teenage homeschooled girls would offer a "teacher in-service day" babysitting service each month! I am going to have to put some thought into that. How much money would make this enticing to a bunch of girls? Would they need adult guidance (or more importantly, would they need my guidance)? * I have to admit that as much as I was tired of the snow two weeks ago, now I am jealous because the entire midwest and north seems to be getting piles and piles of exciting weather. We have gray drizzle. I'm so fickle. * The daffodil shoots are 3-4 inches tall. I'm afraid for the silly little things. * Do you do Swagbucks? I finally gave in when I saw so many of my Facebook friends earning amazon.com cards. I've been doing it for a month and have earned $15 in gift cards, so why not? If you aren't participating and are interested, click on the link somewhere on my sidebar. It'll take you there and give me referral points so that I can get more amazon.com cards. The biggest problem with Swagbucks is that I've become somewhat addicted to a game called "Drop 3." Don't judge. I've gotten myself down to where I'm only playing it twice a day, and I know it's a colossal waste of time, but at least I'm admitting it. 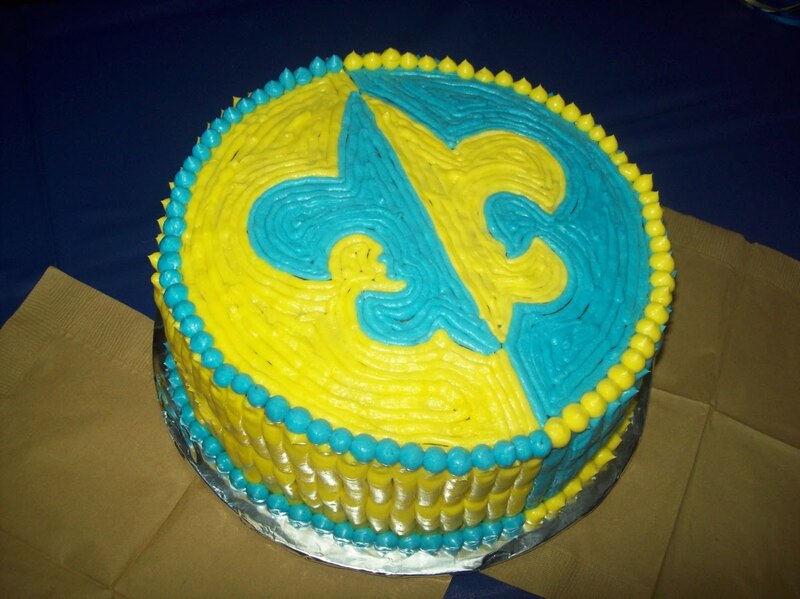 * Tonight we have the annual Cub Scout Blue and Gold banquet. I'm glad my friend Donna is doing all the decorating so that I can sit around and play Drop 3 until 15 minutes before it starts. * Back to the teacher in-service offer. How much would you pay per child for four hours without kids in the middle of the day?